Specifically designed to handle today's braided lines, the Daiwa Saltiga Surf Spinning reels deliver the power, lightweight toughness and high-performing components you need to approach the surf with confidence. 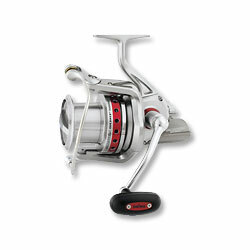 Everything about the Saltiga Spinning Reels is designed to optimize performance in tough saltwater conditions, from the lightweight, corrosion-resistant ''Air Metal'' magnesium body and the seven ball bearings, including three specially treated CRBB anti-corrosion bearings, plus one roller bearing, to the machined aluminum spool and handle. The Saltiga's Digigear digital gear design ensures a perfect mesh between the ultra-tough, surface treated alloy drive gear and marine bronze pinion gear for maximum speed, power and durability. Not only will you be impressed by the way the Saltiga handles big lures and bigger fish, but its tubular stainless Air Bail will not snag line and prevents the handle and rotor from turning during the cast allowing for accurate, long casts. "Great reel. Great cranking power with it's Digigear. Best of all, this baby can cast! My Saltiga Surf is on a custom built 13ft Anyfish Anywhere Surf with lowrider guides. Loaded with 30lbs braid, this combo easily hit a football field and a half with 4-5oz bank sinkers! The line lay is perfect. Nice and even. I recommend it if you're not going to wade the surf. Reel is not a VS or ZB. :)"